The Tillamook County Historical Society will meet Sunday, January 27, 2019, at 1 PM, at the Bay City Arts Center, 5680 A St., Bay City. Cost of the lunch is $10.00. A short meeting will be held to share the accomplishments of the past year, to vote on new officers and to meet in person our new president Rob Russell, as we say thank you to Sally Rissel for her years as president. This is also a great opportunity to join the Historical Society or to pay your membership dues for the year. 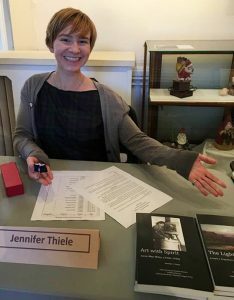 discussing her latest books, written for the Tillamook County Pioneer Museum: The Lightning Painter, about J.J. Englehart, and Art with Spirit, about Lucia Wiley. Jennifer was fortunate enough to forge friendships with members of Lucia Wiley’s family and has many new stories to share about the life of Lucia. This event is open to the public, you do not need to be a current member to join us. The Tillamook County Historical Society is a local, volunteer-run organization dedicated to collecting and preserving the region’s diverse history. It has published numerous books and interpretive pieces, and has two books currently in production. The TCHS holds a monthly public meeting on the second Tuesday from Noon to 1:00PM at TBCC.